I personally do not encourage little munchkins to spend endless time watching TV or PC. Yes, I totally agree that there are bunches of interactive stories and learning stuffs, which help kids in 'learning by doing', brushing up their cognitive skills and of course blended with fun. Hence, I spend 10-15 minutes per day, exposing Liya to the astonishing world of interactive games and stories. We are gonna share our experiences with 'learning by doing' activities, mostly once in a week. This week we were playing the The Mum's and Kid's Playground. 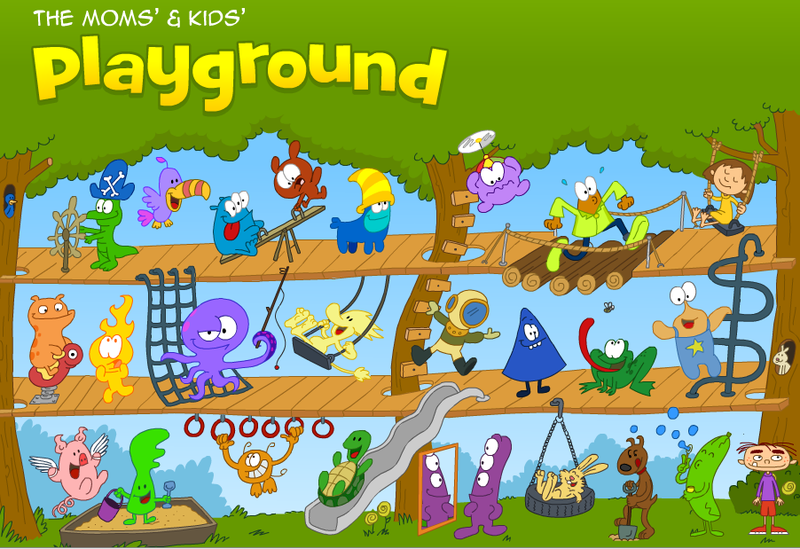 Look at the pic above, there are a lot of items listed, most of them kids usually find in the playground like slide, sandbox, swing, see-saw etc. Each play item is click-able and many of them take into simple interactive games. A few of them opens up stories. Those games are real fun. I attempted those games, with Liya sitting next to me. She enjoyed most of the games. She was exhilarated by the movements, responses and funny sounds. She tried to imitate the funny sounds and giggled along with it. She was jumping in the sofa, when I was 'finding the worms in the sandbox and killing them'. She laughed aloud and danced with joy when I played frog catching the bees. But her favorite game was the Double Hooked, where Octopus fishing with two hooks and helipoper where she loved the 'breaking balloons game'. What I liked most about these games is that, most of these are very simple. Each game is concentrating only on a 'single' activity, not creating any mess with lots of treasures, points etc. If you want to peep in to the game, click here. Interactive games are great learning tools. I agree with you though that it should be used in moderation. I'm glad the Liya enjoyed her creative learning mommy-and-me session. Have a great weekend! I believe its fine in moderation as well, there are some great interactive learning tools these days! I'm a follower of yours already on GFC and Twitter. Just stopping by from the Monkey Hop from www.mommydigger.com. @Brynn - Welcome to Princess Liya's little world. Many thanks for the follows. I will stop by your blog too.